Portrait of Brenda Crew taken on film, 2017. Copyright ©Sophie Polyviou. Drawing made by Kevin, Brenda's son when he was five years old. Brenda unexpectedly became a single mum in the 1970s, after moving back home to the East End. She describes the ups and downs of bringing up her son with his grandparents living next door. Kindly funded by the Gilda Street Trust in memory of historian and author Gilda O'Neill. And that’s where I grew up, yes. Outside toilet and everything. Hi, my name is Brenda Crew, I was born in 1947 and I’ve lived in Plaistow mostly, all my life. And this is my little bit of the story. 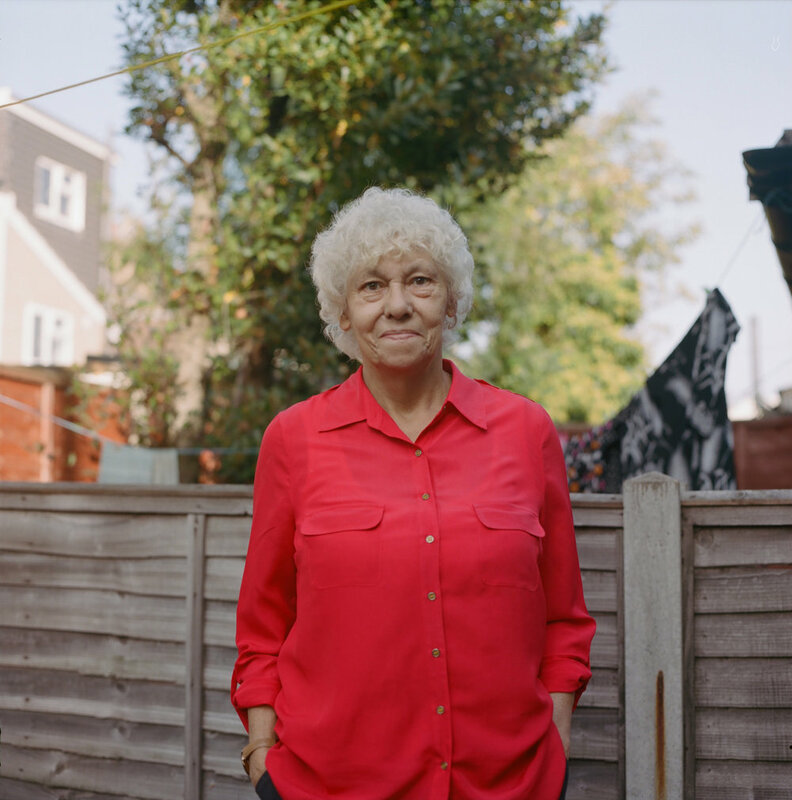 I’m Rosa Schling, I’m a new parent, and I’ve been recording memories of childcare and parenting in London’s East End. This is Holding the Baby, an On the Record podcast. I got married from next door and my husband was in the RAF. And we were just living in different places for four years, all around the country, and then two years after we married I had my son. So what was it like having Kevin when you were over there on the RAF base? I didn’t want him out of my sight. And my dog felt the same, I know it sounds silly, but she was guarding the pushchair or the pram. Anyone came near the pushchair ‘Grrr’ she’d growl! And she even growled at David [Kevin’s father] so that was a start. He wasn’t wanted. But no, Kevin and I coped and our bond is really good. It is a nice, mother and son relationship. So what was it like when you came back? It was like I’d never been away, to be honest, except it was a different house. To be truthful, I divorced David. It was because I was here, David was there, in the camp and he lived his own life and I lived mine with Kevin and it just didn’t work. And Kevin was five when I divorced. David was never, ever around, which was a shame, but my dad was the father figure and we had a gate erected in the garden so that we could just go through to each others houses. When Kevin was able to lift the latch, he would always be in with nanny and grandad. Do you see things as being quite different for single parents now? No, not really. When it was open evening in school his teacher said ‘You would never think that Kevin was [from] a one-parent family. You know, he’s fine. We could say ‘That’s a one-parent child, that’s a one-parent child, but we never realised that Kevin was a one-parent.’ So I think I done quite a good job. [laugh] Mum and Dad wouldn’t say that but I think I did. I tried my best. And that’s all you can do, is try your best. You don’t think your mum and dad would say that? I don’t know. I was quite a strict mum, not unkindly -but I didn’t want Kevin to get into trouble or be a typical one-parent child so I suppose I was a bit hard, but Mum and Dad said I was too hard. If I said ‘Kevin, please don’t do that’ he would go straight into Nanny and Grandad and say ‘Mummy said I can’t watch television’ or something and then they would come in and say ‘Why can’t he watch the television, you’re being too hard on him’. ‘Mum!’ you know, it was awful sometimes having them Right. Next. Door. No, really hard. But all in all it was good because then I knew that I had security in them, and Kevin did as well and I could rely on them to babysit if I had something to do. So all in all it was okay.